Erickson Motors is the MCC engine commercial development company which also provides commercial engineering and machining services. Engine Research Associates, Inc. (ERA) owns Erickson Motors and mainly focuses on MCC engine related military and government research and development programs including SBIR Phase I and Phase II programs. Both companies are located in the same facility at the Northeast Indiana Innovation Center (NIIC). We received the 2016 Torch Award for Entrepreneurs of Integrity by the Northern Indiana Better Business Bureau and won the 2013 Innovator of the Year Award from the Greater Fort Wayne Business Weekly as shown below. Rick Erickson: ERA President and Principal Engineer. He has a BS from Purdue University and is a registered Professional Engineer (PE). Rick provides engineering management, MCC engine design and development, systems design, materials/structural analysis, materials selection, fabrication and testing. 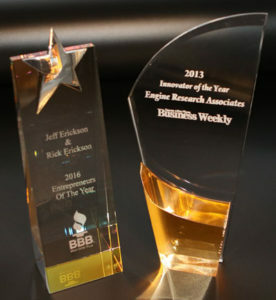 Jeff Erickson: ERA Vice President and Principal Investigator, Erickson Motors General Manager. He has a BS in Computer Science from Ball State University and is a PMI certified Project Management Profession (PMP). Jeff provides program management, business operations management, MCC engine systems integration, fabrication support, testing and data acquisition support. George Lewis: ERA Vice President. He has a BSEE from Cleveland State University and MSEE from Purdue University. George provides program management and new business management, electromechanical and systems engineering. Rhonda Godfrey: ERA Vice President and Controller. She has a BS in Math with Computer Science option from Purdue University. Rhonda provides business and program accounting, payroll, DCAA and DCMA support, vendor and sub-contractor management.